Alucolor creates good ambient air and a lot of light with light and viewing slots. Optionally, you can order the built-in rolling shutters with automatic locking, with safety locking device, with sliding arm and with integrated safety sensing edge for frost. 20 x 30 mm, made from extruded aluminum, transparently anodized, with weatherproof noise insulation inserts. Mobile slat connections made from stainless steel, with air and light slots. Curtain with slats 41 x 8 mm, hollow aluminum profile, baked enamel finish in 100 standard colors. Bottom rail made from extruded aluminum, transparently anodized. Tube made from sendzimir galvanized steel with bearings made from galvanized steel. 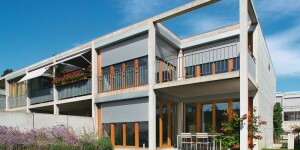 Guide rails, 22 x 55 mm, made from extruded aluminum, transparently anodized, with weatherproof noise insulation inserts. Box in baked enamel finish. Self-supporting system. Fixed slat connections made from stainless steel bands. Curtain with slats 25 x 8 mm, hollow aluminum profile, baked enamel finish in 100 standard colors. Bottom rail made from extruded aluminum, transparently anodized. Tube made from sendzimir galvanized steel with bearings made from galvanized steel. Guide rails, 20 x 30 mm, made from extruded aluminum, transparently anodized, with weatherproof noise insulation inserts. Fixed slat connections made from stainless steel bands. 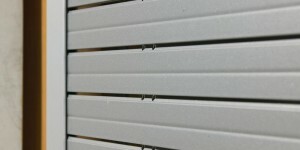 Curtain with slats 25 x 8 mm, hollow aluminum profile, baked enamel finish in 100 standard colors. Bottom rail made from extruded aluminum, transparently anodized. Tube made from sendzimir galvanized steel with variable bearings made from galvanized steel. Guide rails, 20 x 30 mm, made from extruded aluminum, transparently anodized, with weatherproof noise insulation inserts. Fixed slat connections made from stainless steel bands. Curtain with slats 25 x 8 mm, hollow aluminum profile, baked enamel finish in 100 standard colors. Bottom rail made from extruded aluminum, transparently anodized. Tube made from sendzimir galvanized steel with bearings made from galvanized steel. Guide rails, 22 x 55 mm, made from extruded aluminum, transparently anodized, with weatherproof noise insulation inserts. Box in baked enamel finish.